Nathan Richardson, a former TMA student, is working on earning the prestigious title of Eagle Scout. He’s 15 years old, a sophomore at Foothill High School and is still active in Boy Scout Troop 36. If you’re not familiar with scouting, becoming an Eagle Scout is not an easy task. A scout must complete a long list of requirements by their 18th birthday to reach their goal. Fortunately for us, Nathan’s quest to become an Eagle Scout brought him back to TMA. One of Nathan’s requirements was to plan, develop and give leadership to others in a service project helpful to a religious institution, school or local community. 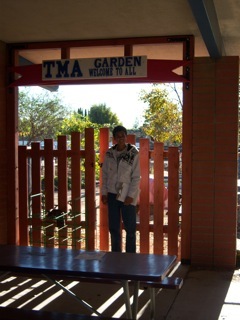 So he approached the TMA Garden and asked if he could create a project to help improve our garden. He chose to rebuild our gate, which was too small and partially a safety hazard. So he built a wider and higher gate to make the garden more accessible and secure.